In today’s episode of PianoTV, we’re going to have a little fun and be a little silly. We’re going to look at mastering musical rhythms….with fruit. It’s no secret that I’m a big fan of fruit. And I’m also a big fan of music! 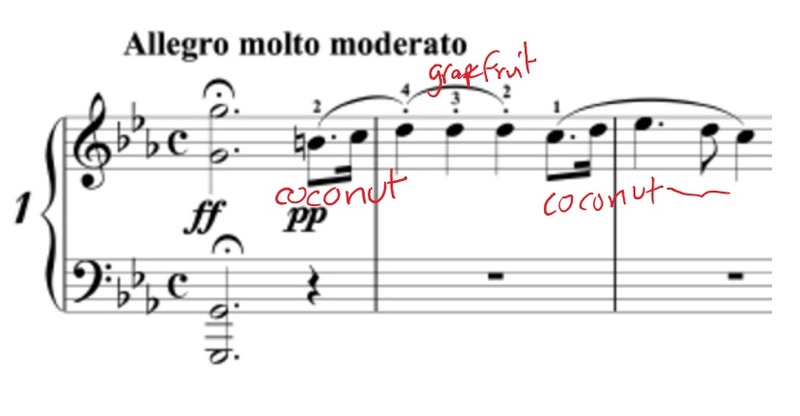 So what happens when you put music together with fruit? Basically the best party ever. Anyway, what we’re talking about today are basically mnemonic devices – verbal tools to help us remember a variety of different rhythms. I was thinking about doing this in my own piano studio, and thought – why not share it with you guys, too? We’ve got everything from simple 8th note patterns (ap-ple pie), to 16th note rhythms (watermelon seed), to complex dotted rhythms (co-co-nut) and various combinations that you’ll come across in your music. In the above rhythmic pattern, you can see the dotted rhythm, which we can by sounding out the word (co-co-nut). See the video if you’re not sure what it’s supposed to sound like! Then we’ve got our 8th note triplets, which can be sounded out with “blue-ber-ry”. Again, take a look at the video if you want to hear the precise beat, and how it sounds against the underlying rhythm of the piece. Play around with these – mastering musical rhythms can be a silly process! It’s nice to not have to take things so seriously all the time. While these mnemonic devices are super useful, if you’re seeking out a more detailed explanation of how various rhythms work, you might want to check out some of the previous posts and videos I’ve done. When you’ve gone beyond basics, it’s important to get a grasp on how to play eighth notes – they’re so common in music, and so frequently played wrong. Once you’re comfortable with 8th notes, maybe it’s time to try out some sixteenth notes, which are twice as fast. It’s useful to understand triplets as well, since they’re fairly common, and as with 8th notes, are frequently played wrong. Finally, these videos on dotted notes (part 1 and part 2) will help you understand the stranger “co-co-nut” and “a-vo-ca-do” rhythms I have in the sheet above. Mastering musical rhythms is something that takes time and effort, but it doesn’t always have to be a super-serious endeavor. Remember to have fun with your musical education! 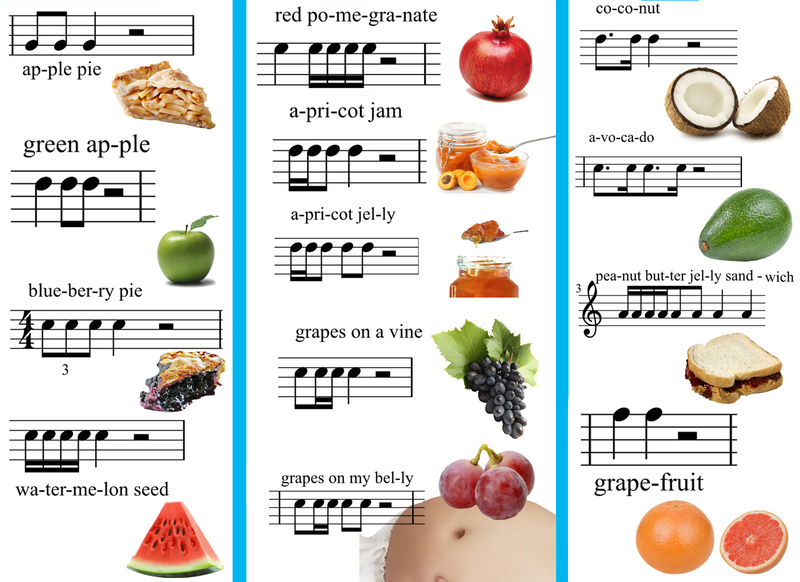 Feel free to print, share or pin the fruit image – I’ll be pasting it in my music studio!